Next Restaurant in Chicago is a very different concept from any restaurant that I've frequented. 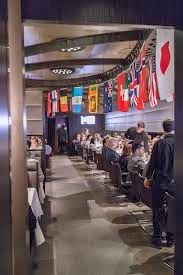 As I've mentioned in my earlier posts about Next (The Hunt, and Bocuse d'Or) Next is a restaurant by Chef Grant Achatz, and features a set tasting menu that changes three times a year - each featuring a vastly different theme. Want to get a reservation? Next is unique there as well... think of it like wanting to go to see a professional sports team - instead of reservations you can purchase tickets. Big fan? You can buy season tickets (which is what we did for 2014!). Can't make it to dinner?Just like if something comes up on a night you have tickets to see a hockey game (or some other sport if you find any of them watchable), you will need to find someone to buy those tickets to Next from you. Why change the restaurant reservations model that is used by like a billion restaurants one the world? You may not believe it, but they did it for us! The goal was to keep food costs down, which would then translate into cheaper prices for us patrons. If a restaurant like Next with a set menu has a reservation, they need to have the product and the staff available to fulfill that reservation. If there is a no-show, there is no revenue to offset those food and staff costs, so prices would have to factor in a certain amount of no-shows - so you would end up paying for those no-shows in the cost of your meal. No thanks! 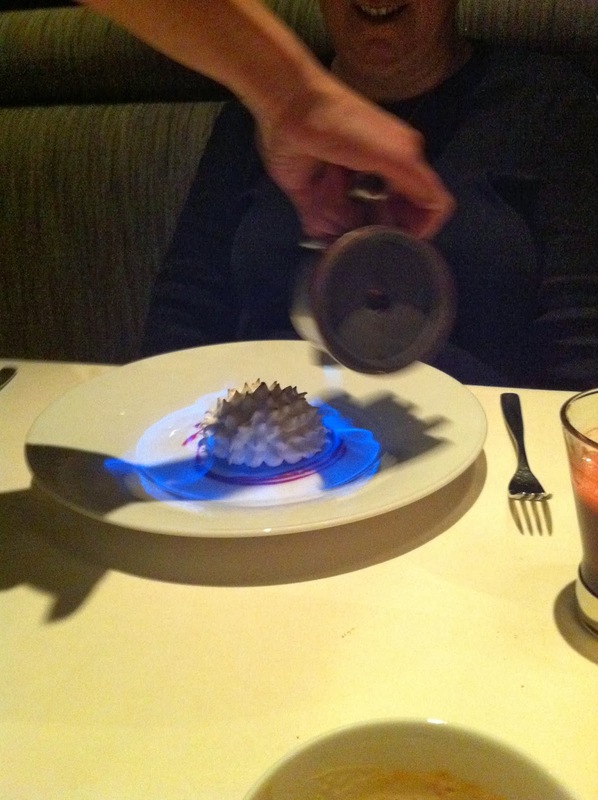 Based on the success of this approach - Chef Achatz's first restaurant Alinea in Chicago has switched to the same ticket model. Oh, and that's not all - the Aviary cocktail bar next door to Next has also started selling tickets in lieu of reservations. In fact, since getting into the Aviary on a Friday or Saturday night is tough and can mean a long wait, I purchased tickets for us to have a funky after dinner cocktail or two at the Aviary. When you arrive at Next you are greeted and asked about your transportation. A nice touch that I absolutely love about Next is that when you are done with your dinner, your car from valet or a taxi will be waiting for you without needing to ask. 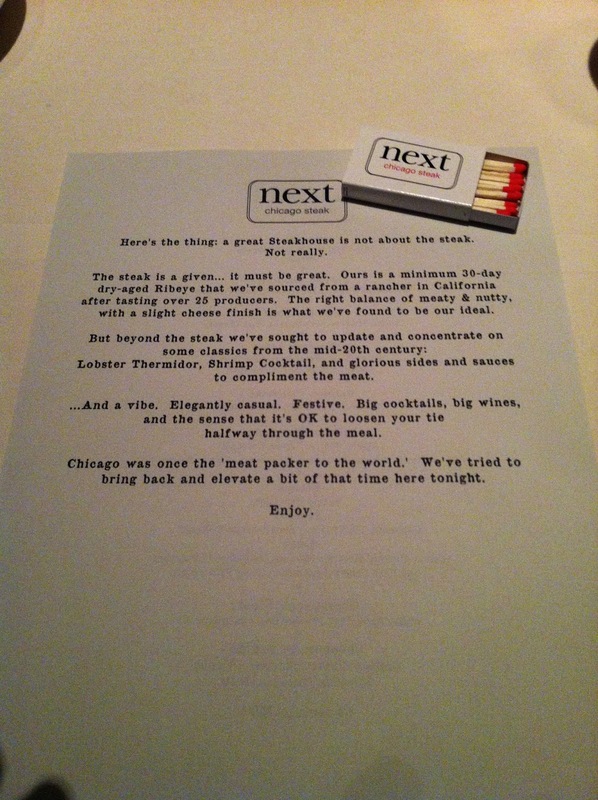 The restaurant is in the meat packing district of Chicago - so not many people will be strolling to dinner at Next! The inside of the restaurant is decorated in a very neutral manner - grays and black. Decorations are then added to support the theme of each menu. The look is very modern and does not distract you from the rightful focus of the evening - some good grub and drink. 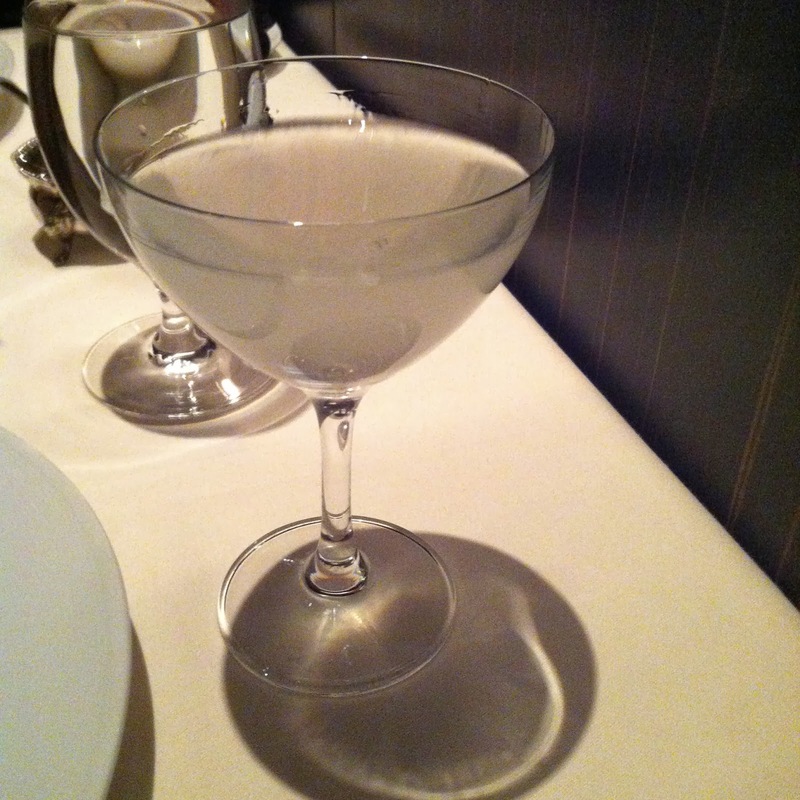 We started off very old school with a shaken vodka martini. My first martini made with a sweet vermouth, it also had a type of boutique bitters. The result, a very tasty drink to pair with food - but not like any martini I've ever had. The crudíte was also a nice old school touch. 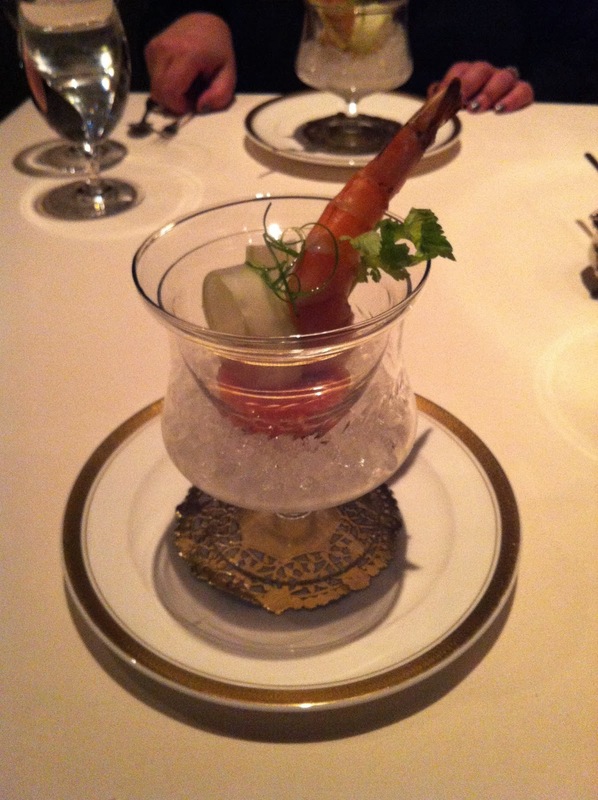 I don't know if the huge bowl of ice was a nod to the past or just a way to present the raw veggies in an artistic way. The veggies (heart of romaine lettuce, radicchio, cauliflower, carrot, radish, probably some others!) were dressed with a non-creamy version of a ranch dressing. Tasted very nice and paired well with the Martini. Can you get more old school than this dish? 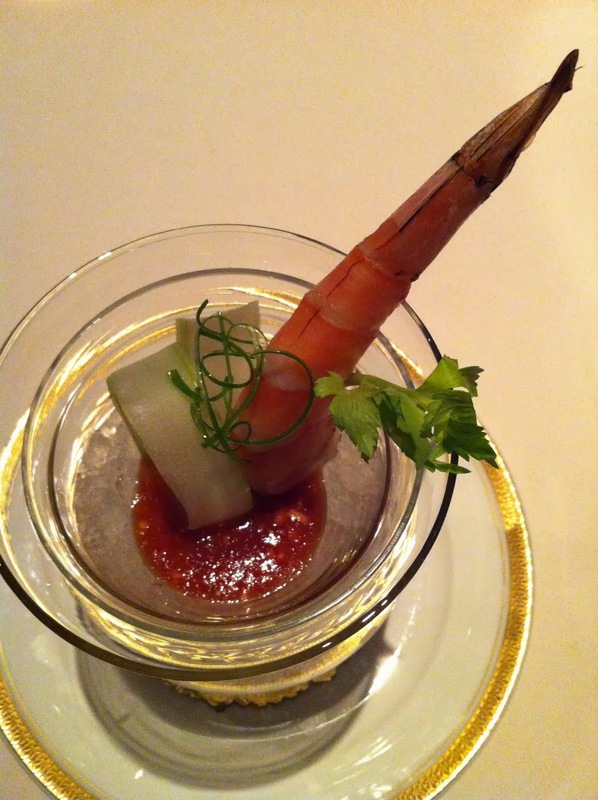 One oxymoronic jumbo shrimp with a delicious fermented tomato sauce. I would like to try a Bloody Mary made from this stuff - I know it would rock. Even with the acidity of the tomato, the martini was a nice neutral pairing. I wish I would have shelled out the bucks for a double breasted pinstripe suit and a fedora... damn! A first at any of the Next dinners we've enjoyed, choice! For this appetizer course, we were given the choice of a clam, oyster, or a mussel dish. Drat! Only two of us and three choices. My guess was that the oyster would be a take on Oysters Rockefeller, which may have been interesting, but Wino4life wife and I were most intrigued by the clam and the mussel dish. I started with the mussel dish and the wife started with the clam dish. 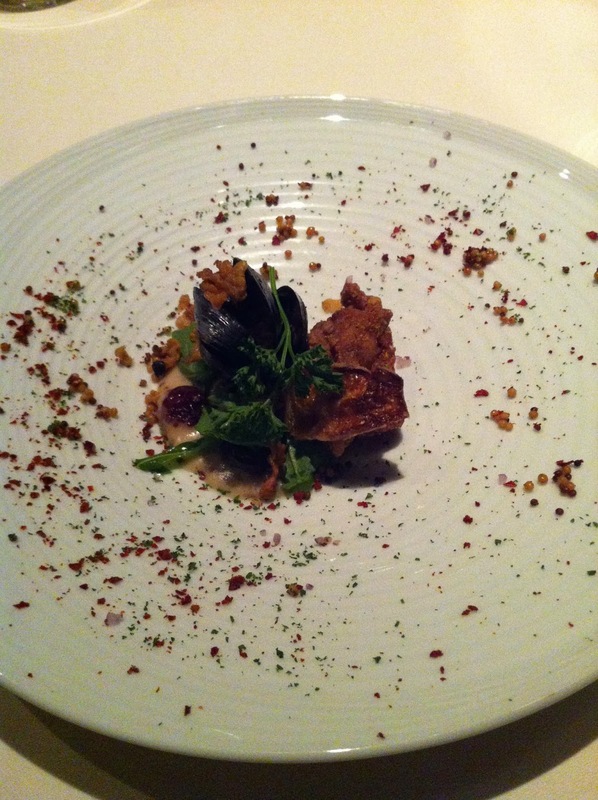 The mussel was tasty, but the sweetbread was the star for me. 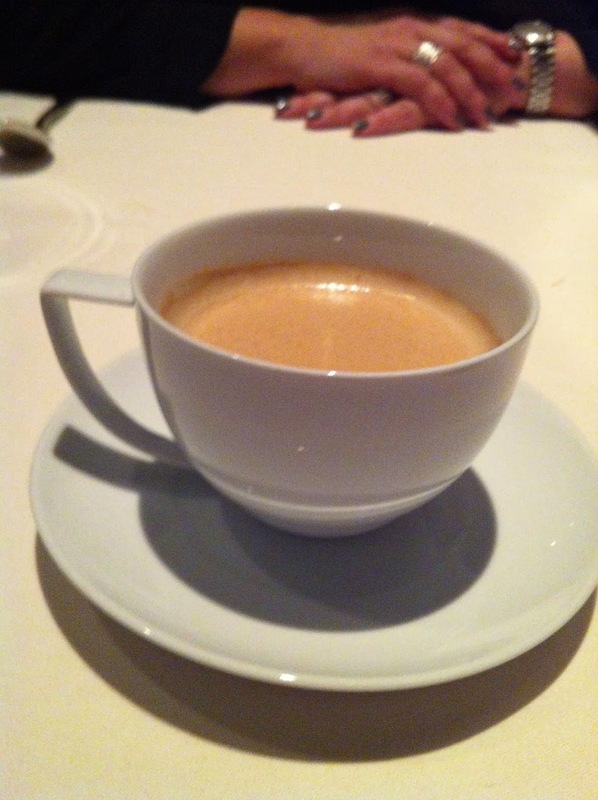 Nicely peppery, the martini's sweetness was a nice match. 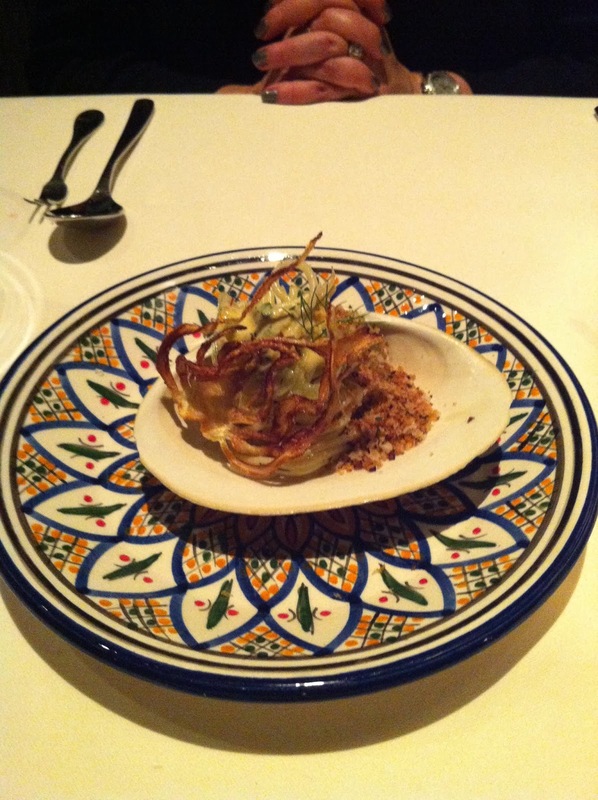 The clam dish was a surprise to me, as it was a cold dish. Cold and spaghetti to me harken more to a late night craving than a tasting menu. 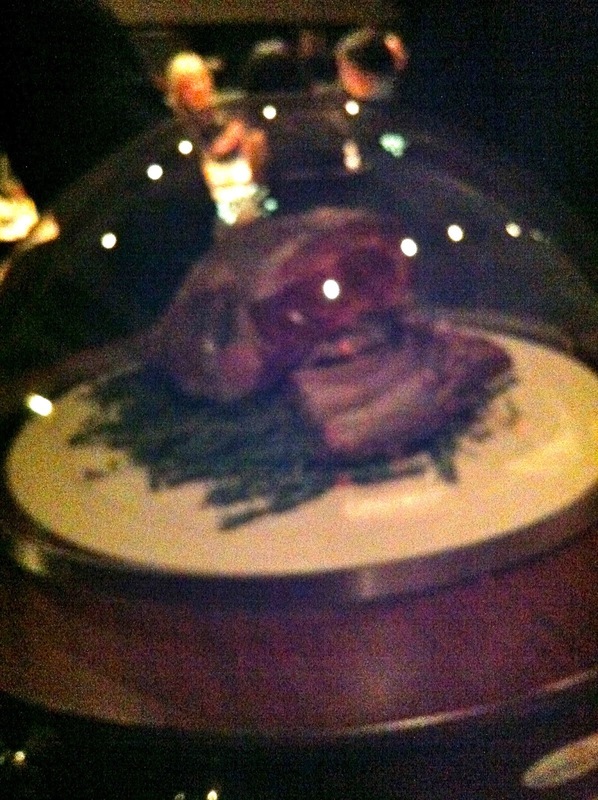 It was not bad, but my least favorite dish at Next. More to my dismay, after reading other reviews of Next Steakhouse menu - the oyster dish was identified as one of the highlights of the meal. Bummer! 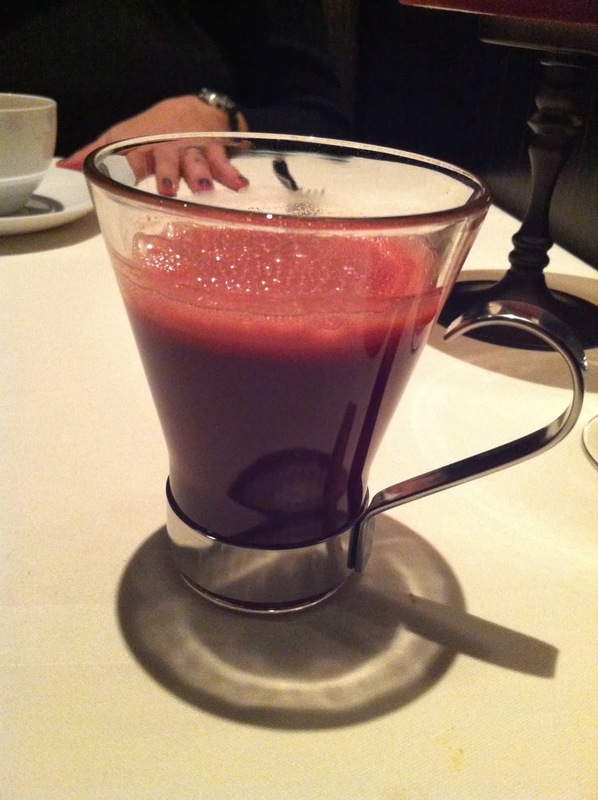 Continuing our old school journey, the next stop was... table-side service! A very refreshing salad with bits of amazingly moist and tender frog legs. Finally time for a different pairing, I am OK with a pairing crossing at most two courses, but for the cost of wine pairings for these dinners I do expect a bit more than a couple of wines and a cocktail. 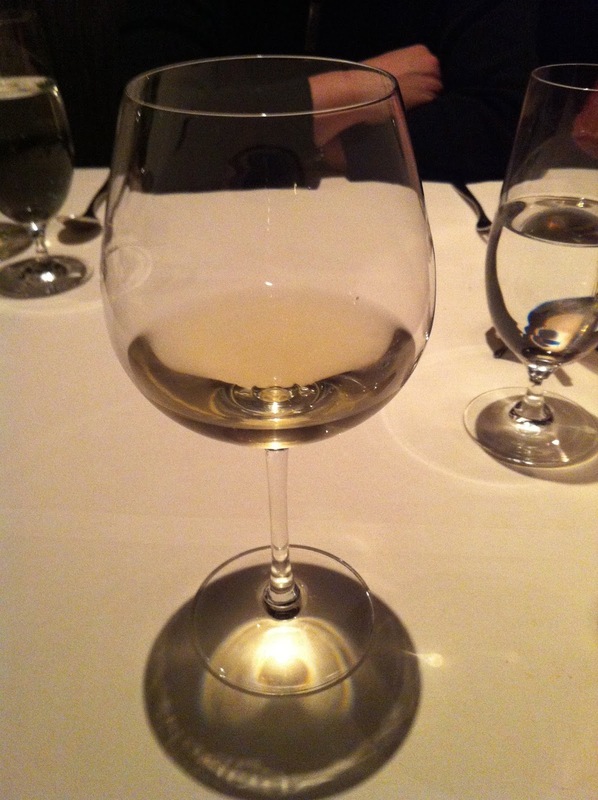 This wine was a Chenin Blanc from the Loire Valley. Just a hint of the lanolin/wet sweater aroma that is fairly standard in Chenin Blanc along with a bit of honeysuckle. 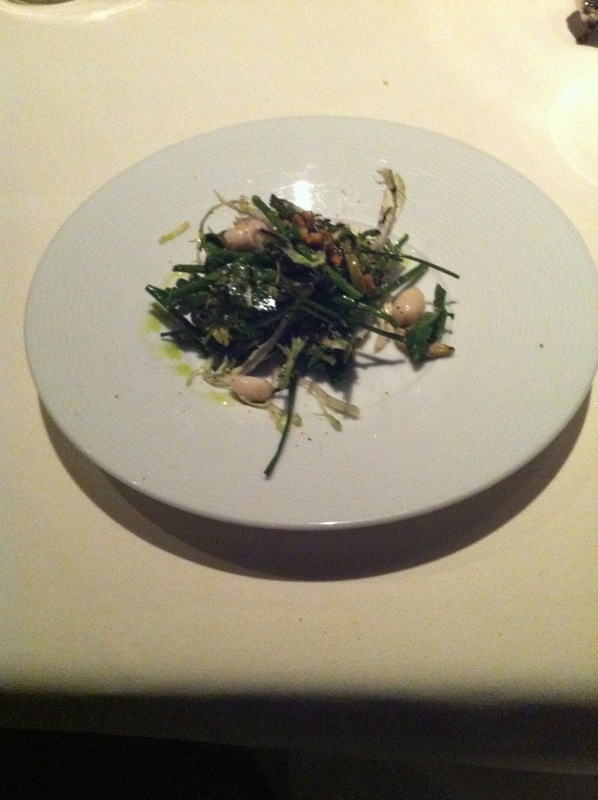 The pairing was very nice with the lighter salad, and the slight sweetness of the frog's legs. 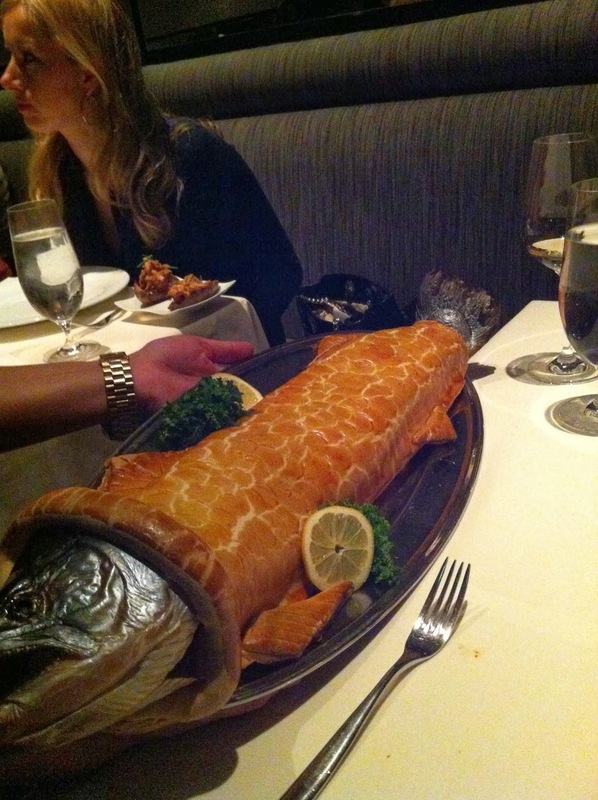 Before our fifth course - a type of salmon roulade, our server showed us what the entire dish looked like. A king salmon in pastry, adorned with old school sprigs of parsley and lemon slices - even the small touches are keeping with the old school tradition. 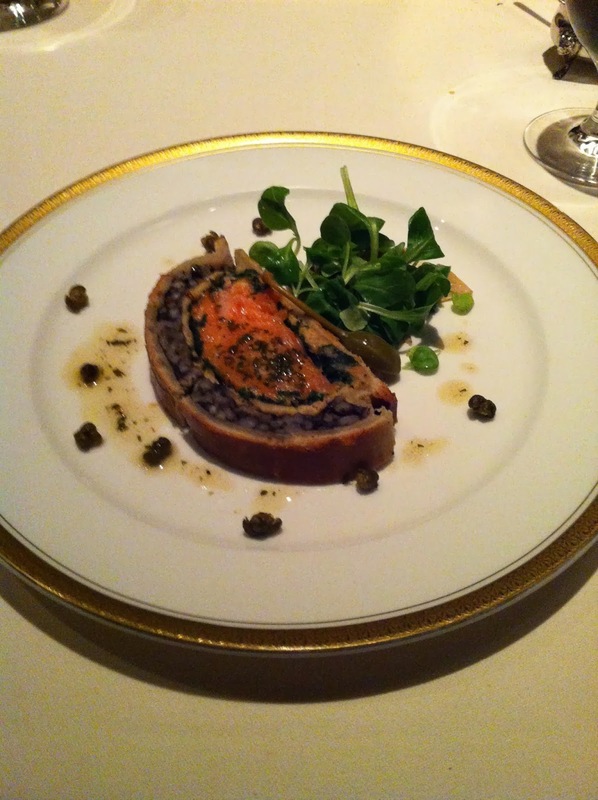 The roll included a mushroom risotto, making it a play on Beef Wellington, another very old school dish. Again I would have preferred a different wine pairing, specifically a Pinot Noir - especially a burgundy. The Chenin Blanc was not a bad pairing, but the earthiness of the risotto and the richness of the salmon called for a bigger, bolder, pairing. Lobster Thermidor is a dish I've long equated with decadence - a dish for the wealthy. Although this perception comes only from a Monty Python skit (Spam, Spam, Spam) - it always stuck with me. 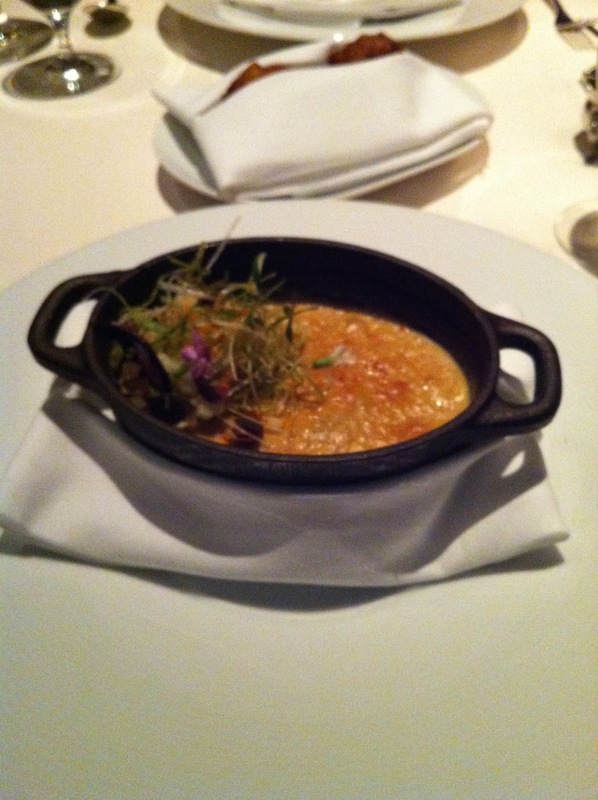 Still, I have no idea what Lobster Thermidor is exactly, and after this dish I still don't. Described as a mashup of Lobster Thermidor and Lobster Bisque, it was incredibly good. 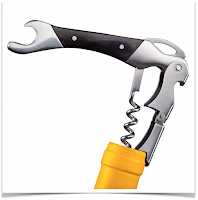 The wine pairing of a white Burgundy verified that lobster and Chardonnay make a great pairing. 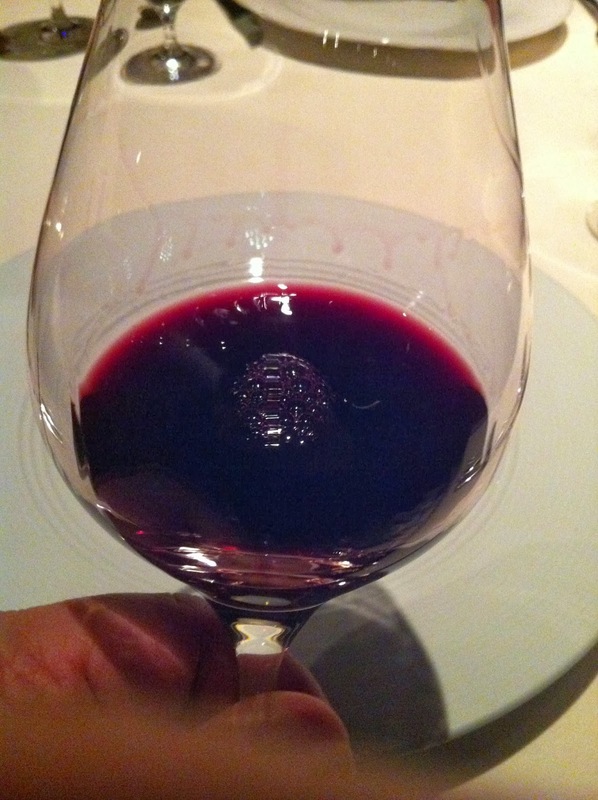 Serving a Pinot Noir with the last course as I recommended would have meant skipping from red wine to white wine, not typically done in tasting menus. Swapping these two courses would still have worked, and made a fantastic dinner even more stellar. 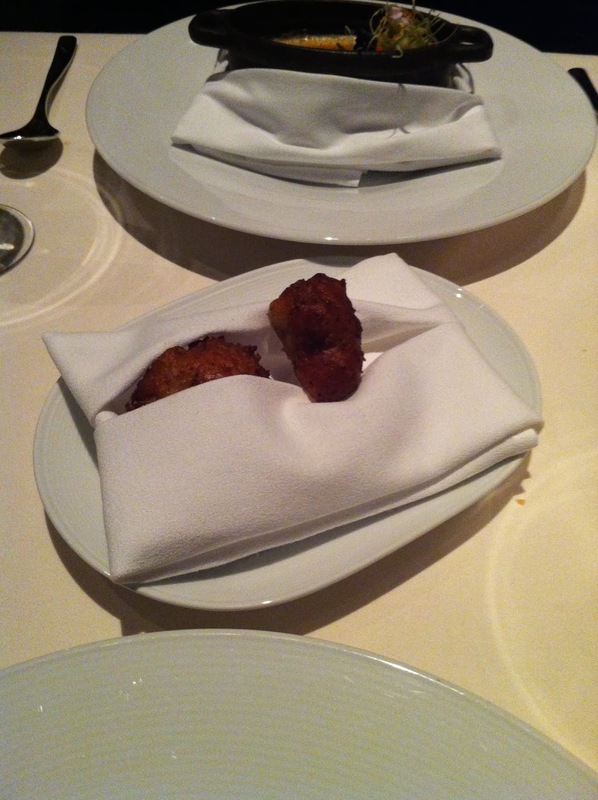 The thyme infused fritters served as a side dish and referred to as "hush puppies" by our server were nothing short of sublime. Seven courses in and our dinner suddenly and drastically transformed. We weren't prepared, we didn't foresee it. We've had many tasting menus in the US and in Spain, but none of our past experience prepared us for what happened next. Luckily it wasn't a bad transformation, just one from a tasting menu to an all out family style dinner! The food just kept coming, a beautifully cooked 30 day aged ribeye steak, an onion gratin made with all the flavors of french onion soup, a twice cooked potato with a welcome addition of bone marrow into the potato puree, brussels sprouts, and three sauces for the steak. Normally I would consider it a crime to put anything but salt and pepper on such an excellent cut of meat - but the Next Steak Sauce was like a millionaire's A-1 sauce. Now let's talk wine. 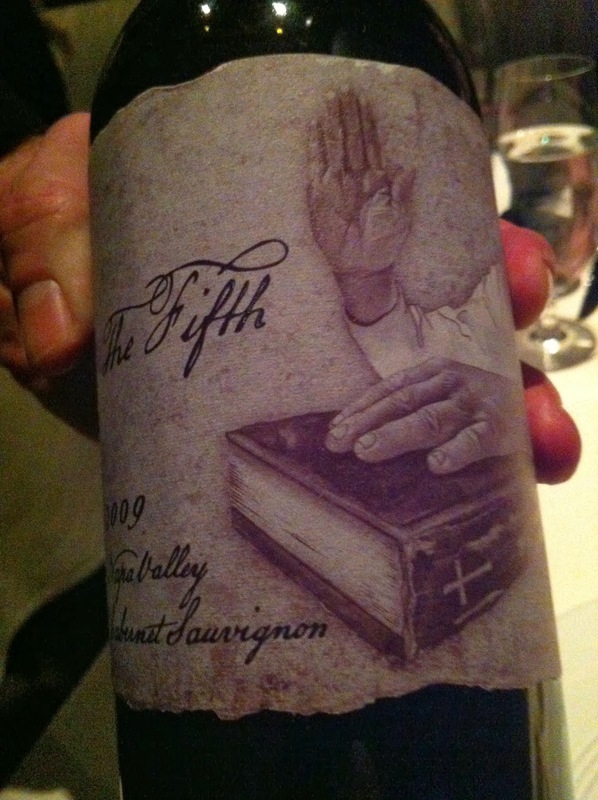 My only criticism of Next has been the pairings for this meal... well they have scored a home run with the Napa Valley Cabernet Sauvignon called only "The Fifth." This wine was fruity and nicely tannic, but not overly so for a fairly young wine. Absolutely delicious. The wine is made by a former sommelier, who buys grapes from various unnamed sources in Napa Valley and keeps it a secret (pleads the fifth). I have contacted them to see how I can get some more of this... I hope to do a full review of this wine in the future. 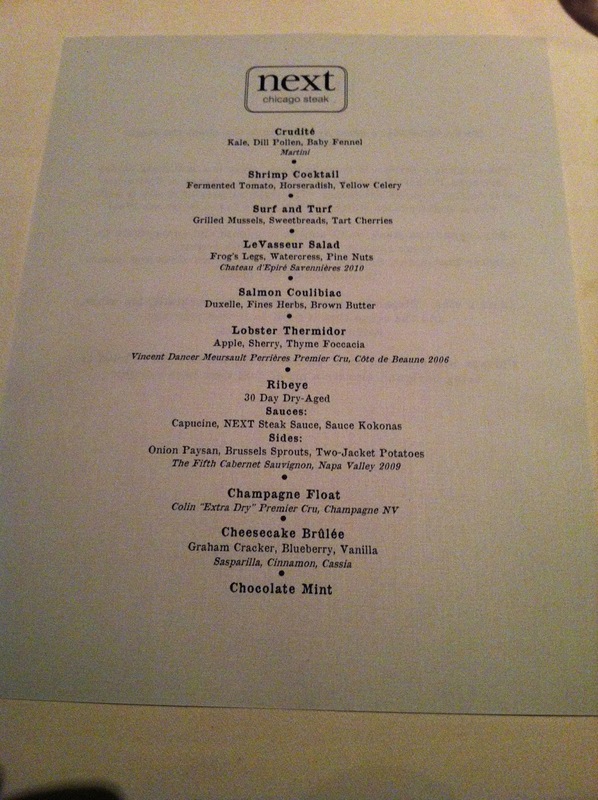 This tasting menu became an incredible steak dinner with an amazing Napa Cab. The only appearance of Steak for the night was done in style... thank you Next!!! 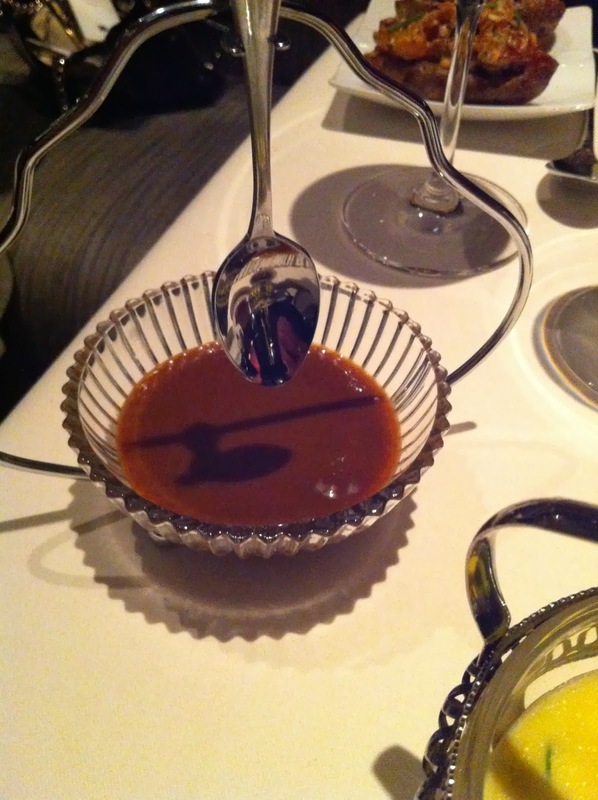 I could easily have called it quits after the last course, but an intriguing dessert changed my mind. 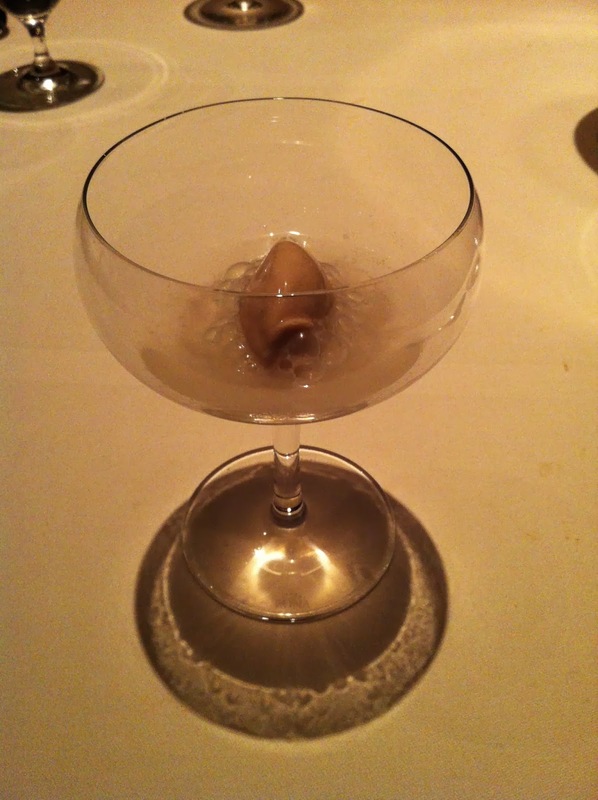 An extra dry Champagne "float" with a brioche ice cream to pair with the toasty/yeasty notes of the ice cream. 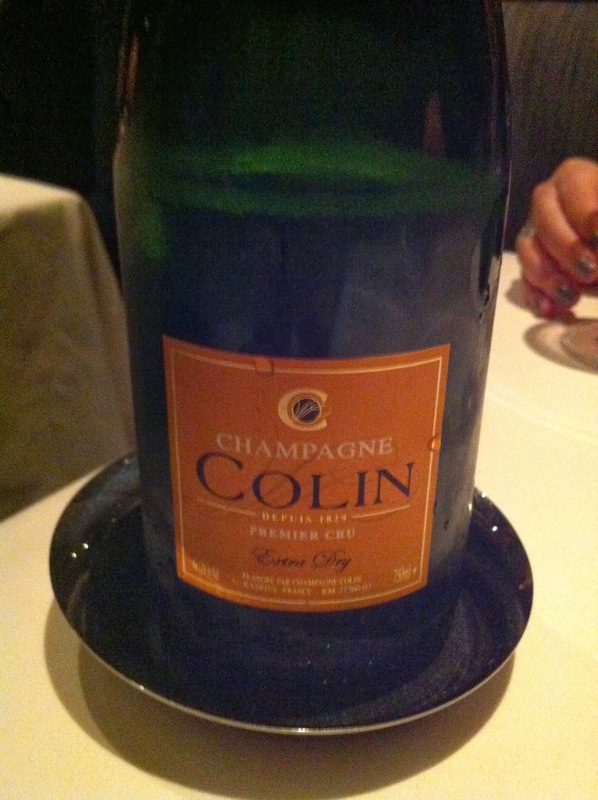 A very dry champagne with ice cream made no sense to me from a pairing standpoint, but it was great!!! Batting in the ninth position was a duo of desserts. 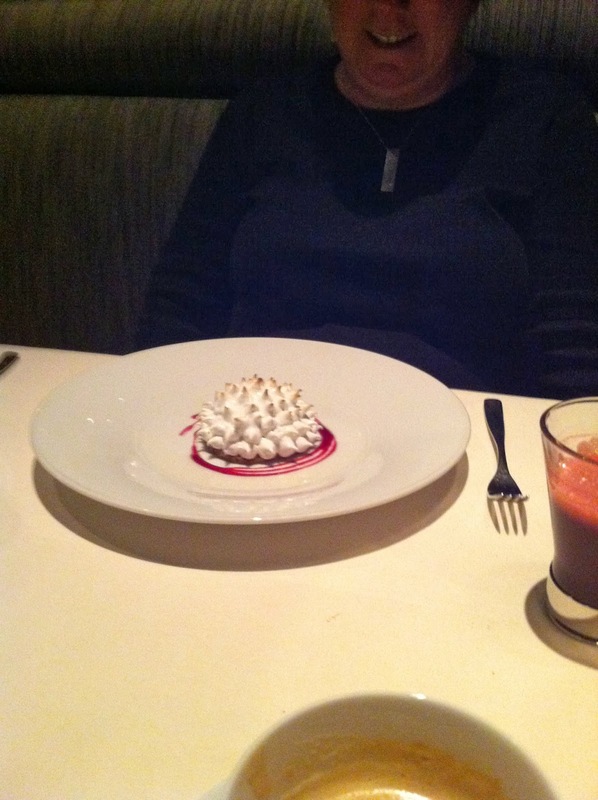 Wino4life wife was served a Baked Alaska, flamed at the table. 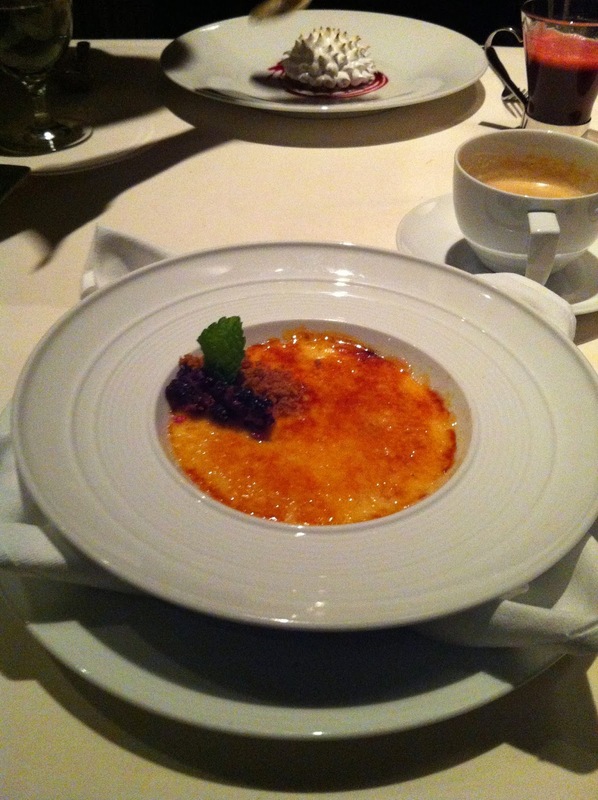 I was served a kind of a creme brûlée - but called a Norwegian omelette. Yeah - breakfast for dessert! Our drinks were a caffeine version (coffee), and a decaf version (some type of mulled black currant drink) spiked with a bit of scotch and some other flavors. 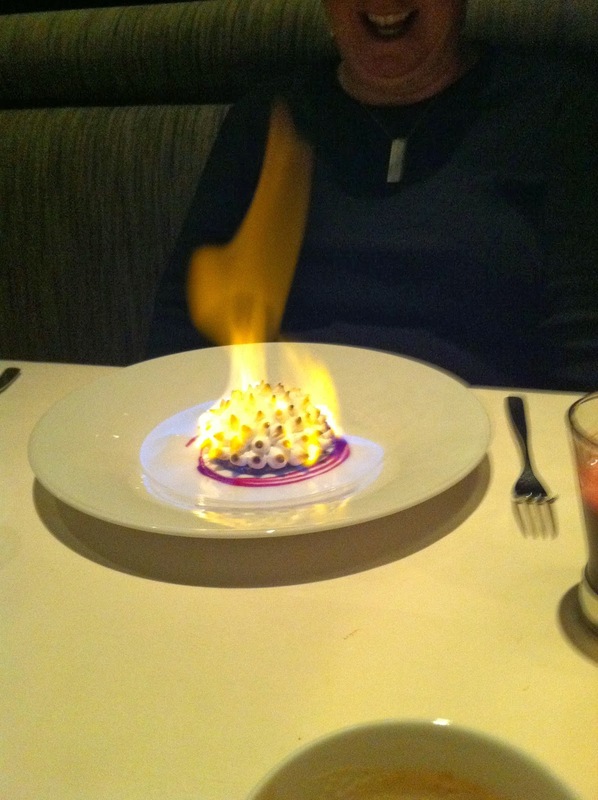 All components were very tasty - but I think I liked the Baked Alaska thing - mostly because it came with fire! Minty Fresh - Not Mediciney! We were more than full at this point, but our meal went into extra innings with one last course. This dish was an ode to a great Chicago classic - Frango Mints from Marshall Field Department stores. 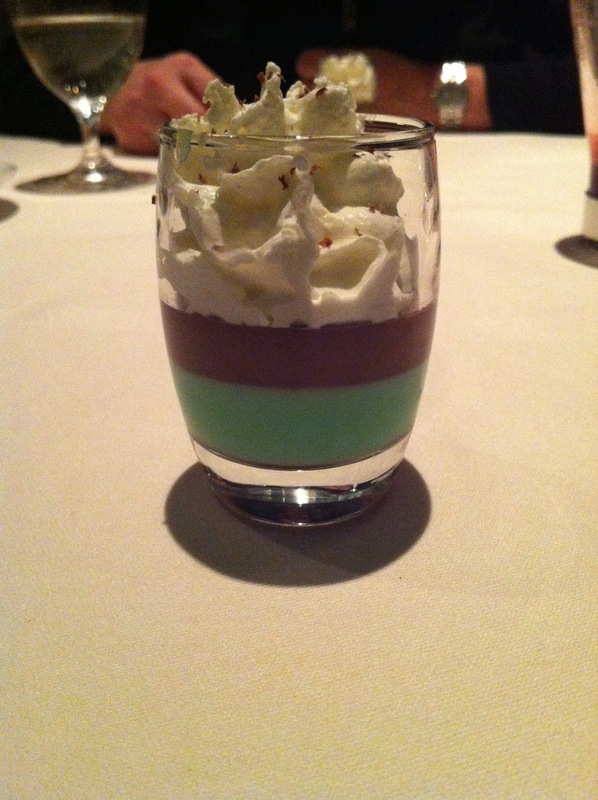 Like a really, really good Ande's Mint, this was a very nice finish to a great meal. As usual, our meal ended with souvenir menus. A nice extra touch was that the appetizer we each chose, and the desserts we were each served were factored in, so each of our menus was specific to our dinner. One last old school touch - a box of matches with the restaurant name on it. I'll save those for a cigar later. Next up (pun intended) - Modern Chinese menu that we will be experiencing in August. Can't wait!!! And it may not even be snowing in Chicago!